The Home Again interactive DVD is an easy-to-use, ready made collection of songs arranged specifically for small groups who don't have a regular worship leader. Led by some of the most well known worship leaders in the world today, each DVD in this series features simple, acoustic recordings of both familiar and new worship songs; each one arranged with you and your small group in mind. Functions include synchronised-to-music scrolling lyrics, acoustic guitar tutorials and a DVD-ROM to enable you to print words and chords. The result - a highly flexible worship tool for today's modern church. 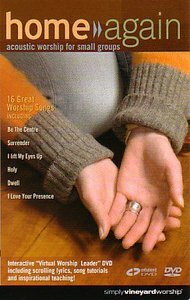 About "Home Again: Worship For Small Groups (Volume A)"